An analysis of two film adaptions of the gothic vampire novella Carmilla by Sheridan Le Fanu. Predating Dracula, Sheridan Le Fanu’s Carmilla (1872) has continued to provide inspiration for many vampire films and has spawned various adaptions. It is a short story set in 19th century Styria about a young woman called Laura who becomes close friends with her mysterious houseguest Carmilla. Around this time Laura begins to have strange nightmares and her health starts to decline. Carmilla is later revealed to be the vampire Countess Millarca Karnstein by General Spielsdorf, whose niece Bertha was suffering the same symptoms. The vampire is subsequently staked by vampire expert Baron Vordenburg- yet it is implied that Laura never recovers from her encounter. Recently, Sheridan Le Fanu’s Carmilla has been given an interesting new reimagining in the Youtube series Carmilla (2014), which sees the action transported to a modern day university. 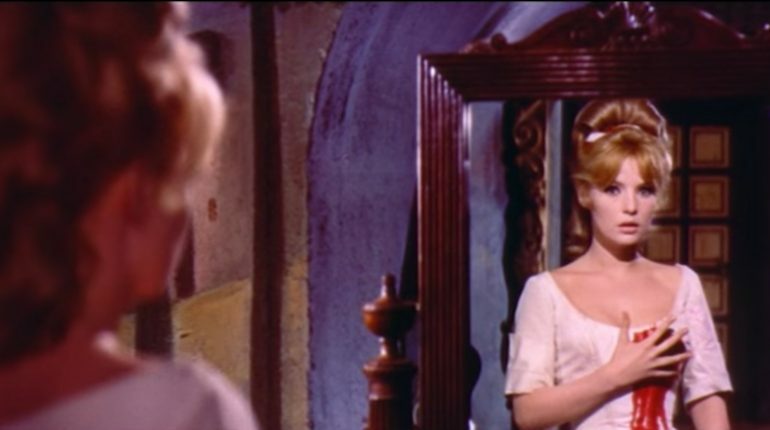 This two part series will analyse two very different earlier adaptions of the source material- Et Mourir de Plaisir (And to die of pleasure, 1960) and Hammer Horror’s The Vampire Lovers (1970). First, we will look at Et Mourir de Plaisir– directed by Roger Vadim (Barbarella) and starring his then wife, Annette Vadim as Carmilla.